The Lian Li PC-Q33 - A Small Form Factor Mini-ITX Chassis You'll Flip Your Lid For! The move from air to liquid cooling has become easier and easier thanks to top name brands like Corsair releasing great all-in-one liquid cooling solutions. The entire Hydro Series has been a success and Corsair continues to march forward this year with new products at CES 2014. The new Hydro H105 comes with two great new features that have members of the press drooling. The Corsair Hydro H105 is a 240 mm radiator system like the original H100 series liquid coolers. It comes with two high-performance SP120L 120 mm fans, low profile CPU cooling block with copper base, and is now 38 mm thick. This increases the cooling surface area and improves heat dissipation. In addition to this, the mounting system has been tweaked to create what some have called “the simplest mounting mechanism we have experienced". We haven't received our review sample yet, but the Futurelooks Team members that that did drop by Corsair at the show, can confirm that this is true. Overall, we have better performance, a system that works with practically every AMD and Intel socket, and you can have it at an MSRP of $119.99 US. It also comes with switchable color plates for the CPU block, allowing you to match your build's color scheme. 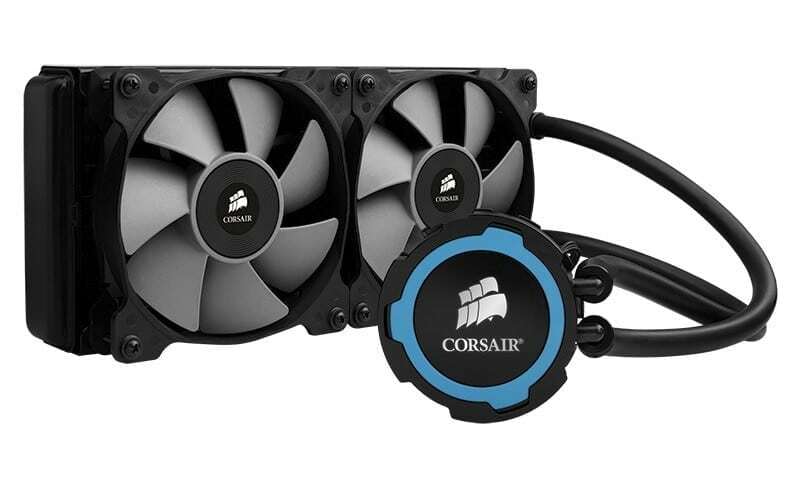 January 7, 2014 — Corsair®, a world leader in high-performance components to the PC hardware market, today announced the all-in-one Hydro Series™ H105 dual-fan 240 mm liquid CPU cooler. The H105 is Corsair’s first Hydro Series cooler to be equipped with a 38 mm thick 240 mm radiator, greatly increasing radiator surface area and improving heat dissipation. Fitted with a pair of high-performance SP120L PWM 120 mm fans designed to balance static pressure and noise levels, the H105 pushes liquid cooling performance to the next level in the 240 mm category. The H105 also benefits from Corsair’s new tool-free CPU mounting block, called by press “the simplest mounting mechanism we have experienced*” and making installation easier than ever. The low-profile CPU cooling block also includes an LED backlit logo and replaceable color ring, allowing PC enthusiasts to co-ordinate their CPU cooler to match their other system components. Connecting the cooling block and 38 mm-deep 240 mm radiator are a pair of sealed and kink-resistant rubber tubes, with a high-quality on-board ceramic-bearing pump providing reliable flow and heat transfer away from the CPU. As with all Hydro Series CPU coolers, the H105 is completely self-contained, requires no maintenance or filling and is supported by a five-year warranty. By retaining the popular 240 mm radiator mount, the H105 is also compatible with the vast majority of cases on the market, meaning enthusiasts need not worry about having to compromise on their choice when it comes to case or CPU cooling. “For 240 mm radiators, we've had a lot of requests for a thicker version with more surface area to improve cooling performance. Now those requests have been answered,” said George Makris, Product Manager for Cases and Cooling at Corsair. The H105 supports a wide range of Intel and AMD CPU sockets and is available immediately for $119.99. Priced at $119.99 MSRP in the United States, the Hydro Series H105 liquid CPU coolers will be available in January from Corsair's worldwide network of authorized distributors and resellers. The cooler is backed with an industry leading five-year limited warranty and Corsair’s excellent customer service and technical support.